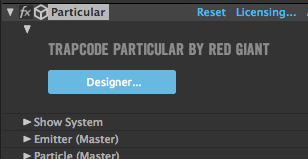 The top of the Trapcode Particular interface contains a conspicuous button. This button launches the Designer - a separate interface window that offers an alternate way of building effects within Particular. The Designer provides a simplified, interactive and more visual Particular experience. The foundation of the Designer is based on the concept of building blocks. By applying a block, you apply an attribute to your particles. Each block is contained within a category that corresponds to the groups in the main plugin, and contains a subset of the controls that you will find in the plugin. 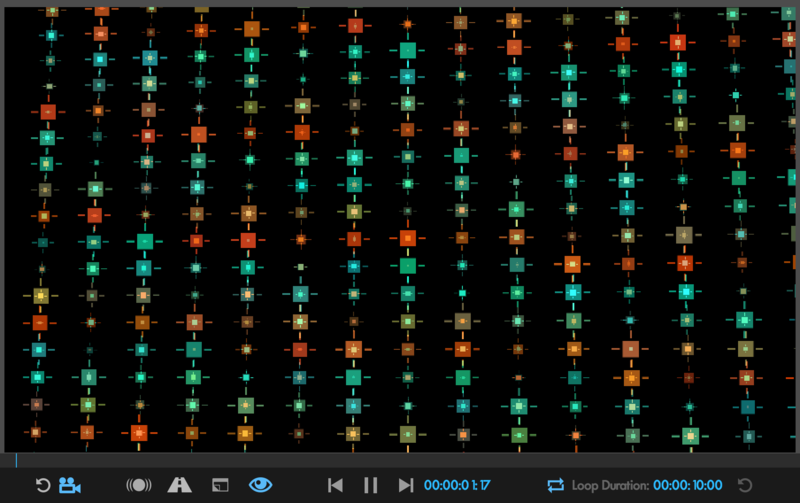 You can combine these blocks to create an end result that can be viewed as an effects chain and saved as a new preset. Open the Designer by clicking on the Designer button in the Particular effect in the Effect Controls panel in After Effects, select an Effect Preset as your starting point or just start exploring and creating using Blocks to build your own custom effects. See the Effect Presets in the Designer section for more detailed information on working with presets within the Designer. 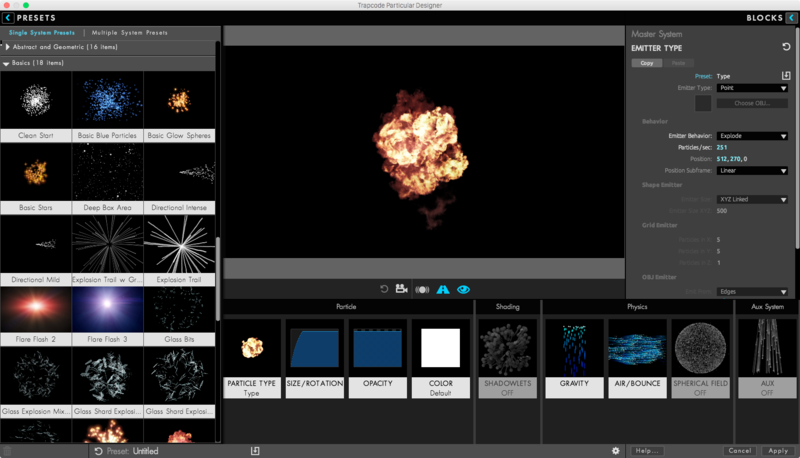 To simplify the process of creating a particle system, blocks are organized by categories; Emitter, Particle, Shading, Physics, and Aux. Each block provides controls that allow you to further customize the effect. See the Blocks in the Designer section to learn more about working with the Blocks. 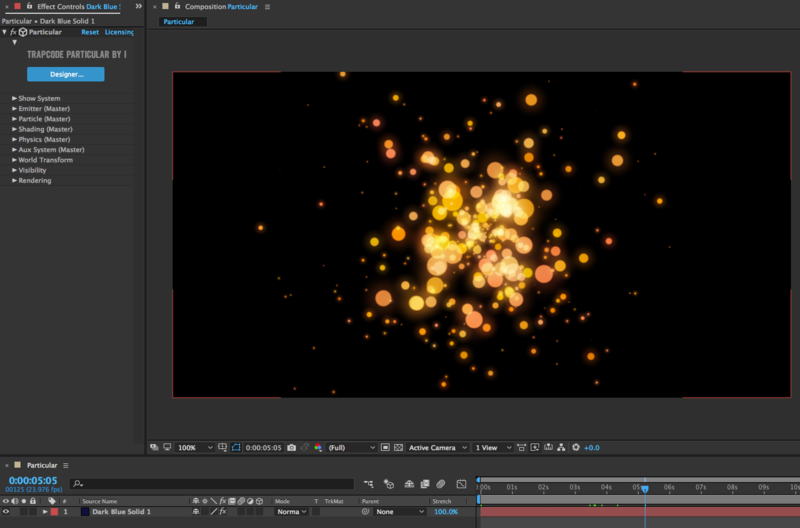 Below is an example of a Color Block's controls that can be used to preview and adjust the color of the particle when selected in the Effects Chain at the bottom of the Designer. 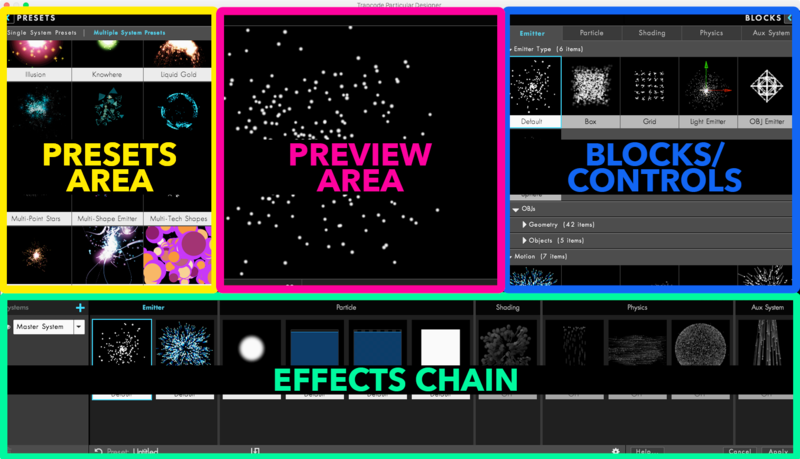 The Effects Chain also lets you control the attributes of each system in Multiple Systems. The Effects Chain in the Designer page goes further into depth about using Blocks within the Effects Chain. If you like what you have created in the Designer, click the Apply button at the bottom of the screen. This will take you back to After Effects where you can further adjust the controls in Particular and render it in the After Effects timeline. If you'd rather not apply the effect, hit the Cancel button to return to After Effects with no changes applied to Particular. After applying the effects in the Designer, you will see your settings in the main Particular plugin. You can make additional changes in the plugin or go back to the Designer. Changes you make in the plugin will be reserved as you go back and forth between the plugin and the Designer. For more information about roundtripping between the Designer and the main plugin refer to the Effects Chain in the Designer section of the user guide.